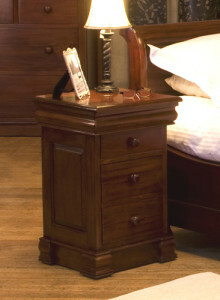 A bedside table is a useful addition to any bedroom, providing the ideal spot for a reading light and an alarm clock. 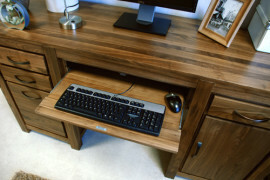 At The Wooden Furniture Store we have over 20 different styles to choose from, so here are our favourites designs …. For a traditional bedrooms, the La Roque four drawer lamp table is perfect choice. This beautiful table is made from solid, environmentally friendly mahogany and has a secret concealed drawer for valuables. For a completely different feel our Atlas block will give a modern look to any bedroom. The clean and simple lines are emphasised with a soft satin lacquer to highlight the natural grain of the oak. If you’re bed is the focal point of the room, go for a white bedside tables that will blend into the background. The Whitehaven range has some stunning designs and we love the clean lines of this bedside with vertical compartments. 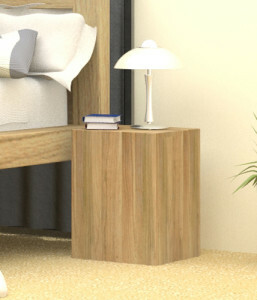 The bedside has chunky plinth detailing which enhances the subtle curved cornicing and the metal cup handle on the drawer. 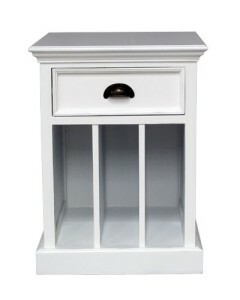 The Whitehaven range is hand made to order and given a fresh white painted finish. Matching tables each side of the bed will create a symmetrical look that conjures up a boutique hotel feel. 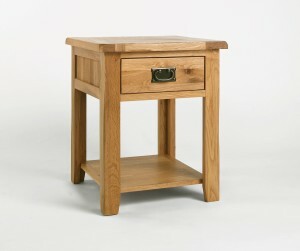 The Westbury Reclaimed Oak lamp table features a single drawer which is finished with classically styled dark metal handle and a useful shelf at the bottom. If you’ll be using your bedside for hiding away cosmetics, remote controls plus space for a lamp and phone, then you’ll need a larger bedside table with drawers. 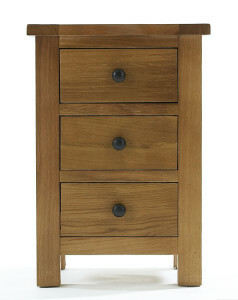 Our new bedroom furniture range – Lavenham Oak – has a stunning three drawer bedside. The natural grains in the wood are highlighted with a satin varnish and finished off with round metal knobs. If you just need somewhere to just put your alarm clock, then a small table without drawers will do the trick. 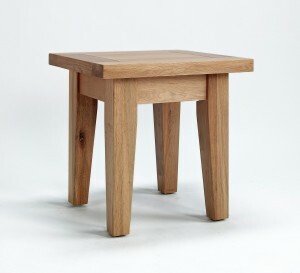 We love the simple design of the Sherwood Oak lamp table especially the chamfered leg detailing. Still need some more ideas? Then our entire range of bedsides can be viewed here and remember all of our furniture is delivered fully assembled within 10 working days (with the exception of the Whitehaven range which is made to order).